Much like DanceDanceRevolution UNIVERSE2, DanceDanceRevolution UNIVERSE3 can be played on American and Japanese Xbox 360 consoles. Final CS DanceDanceRevolution title to feature licenses from the A Different Drum label. First and only North American DanceDanceRevolution release to feature Konami's licensing partnership with avex's house nation compilation series. Third Xbox series DanceDanceRevolution game to feature a commissioned partnership with Diskowarp Records. First DanceDanceRevolution title for an Xbox console to use brackets for song titles. Final Xbox DanceDanceRevolution game developed by Hudson Soft. Several songs are announced in the back of the game's box that are not included in-game. For the first time in the Xbox series, UNIVERSE3 has jumps count as one step for combo purposes, similar to every arcade DanceDanceRevolution title since DanceDanceRevolution SuperNOVA. It also follows the DanceDanceRevolution SuperNOVA2 grading system now of 990,000 points being required for a AAA, as opposed to max score. First console DanceDanceRevolution title to use jackets instead of banners for songs on the song select screen. The arcade DanceDanceRevolution series would adapt this practice beginning with DanceDanceRevolution X2. Quest Mode is a revamped version of DanceDanceRevolution ULTRAMIX4's unlocking system. 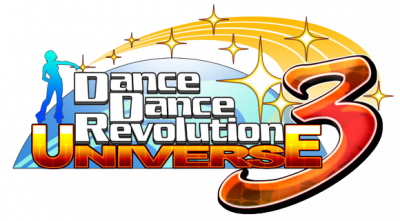 DanceDanceRevolution UNIVERSE3 is currently the only UNIVERSE title to have (most of) its DLC still available. None of the DLC from previous UNIVERSE titles work on UNIVERSE3, and have to be bought again. None of the original DanceDanceRevolution dancer cast returns. All characters are original to the game except for VALENCIA, GUY, RICO and SYLVIA, who first appeared in DanceDanceRevolution (PC). VALENCIA can be downloaded as a paid DLC announcer. She's the only DanceDanceRevolution character to appear as an announcer and makes the game one of the few DanceDanceRevolution CS titles to feature a Japanese announcer. Only American DanceDanceRevolution CS title with lyrics on-screen. It is also the only DanceDanceRevolution title since DanceDanceRevolution 3rdMIX to feature lyrics for KONAMI original songs. Some Achievements in the game are impossible to obtain, and have never been legitimately obtained (e.g. unlocking all costumes), due to a few timing issues that are present in QUEST MODE. Some challenges (some of which involve getting 100% GOODs) cannot be cleared, which are required to unlock some items. A Chinese version of the game was later released, with some exclusive songs. This page was last edited on 28 March 2019, at 12:30.